The musical form commonly known today as the Fantasia, has it's origins in another form - the Ricercare. This earlier form was born out of an improvisatory style in which variations were created based on popular songs, standard airs, and dance tunes. The toccata, prelude, ricercare, fantasia and intonazione are all examples of this stylistic form, the terms seem to be more or less interchangeable. These works arose from a musician's need to test the tuning of his instrument, fix the tonality for a vocal performance, warm up his technique, set the stage briefly for some other music to come, or occasionally fill an interlude between songs and dances. An important figure in the development of the ricercare is Francisous Bossinensis (Franjo Bosanac, or Francá from Bosnie), who as his name suggests was born in Bosnia in the late 15th century and lived for some time in Venice. A lutenist, he composed for that instrument and voice principally using the Italian forms ricercare and frottole. 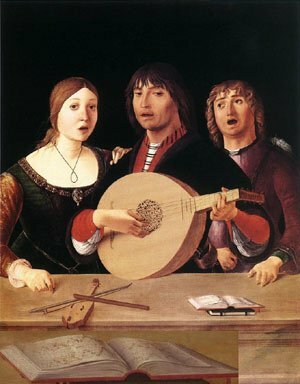 The frottole was a secular song (popular between 1470 and 1530) that eventually became the madrigal, and the ricercares were conceived as instrumental preludes to individual frottole. Two of his collections were published by the music-printing pioneer Ottavio Petrucci, in Venice (1509) and Fossombrone (1511). These ricercares were clearly meant to be played in conjunction with the songs they accompanied, and not as independant works. 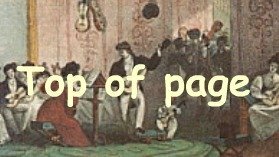 Early ricercares such as these consisted mainly of running passages mixed with strummed chords, and also featured an attempt to achieve a polyphonic effect through the use of independant voices, one in the high register and the other in the low. 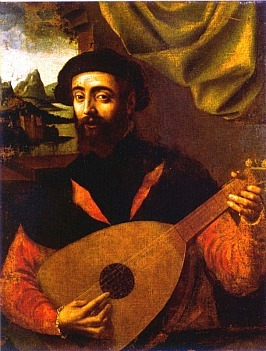 Later that century the prominant lutenist Francesco da Milano further developed the recercare, creating works that were longer and more structured than earlier compositions, and featured techniques such as imitation and sequences. These works were written purely as instrumental perfromances with no referance to vocal works as was prevelant beforehand. In da Milano's publications we see the transition from the name "recercare" to "fantasia", indeed some of his works were originally called recercares and then subsequently in later editions the selfsame compositions are termed "fantasias". The fantasia or "fancy" as it was sometimes known, was also important in late 1500 England. King Henry VIII and Queen Elizabeth I both employed Italian musicians in their royal courts and musical forms like the fantasia migrated along with the performers. English fantasias were generally composed either for keyboards (virginal or organ) or for chamber ensembles known as "consorts". English lute fantasias were rare but composers such as John Dowland left us with some quality works. Downland's fancies contain many characteristics of the later fugue, he used the title "fuge" once, but that for a short canon.